It's actually at a corner! 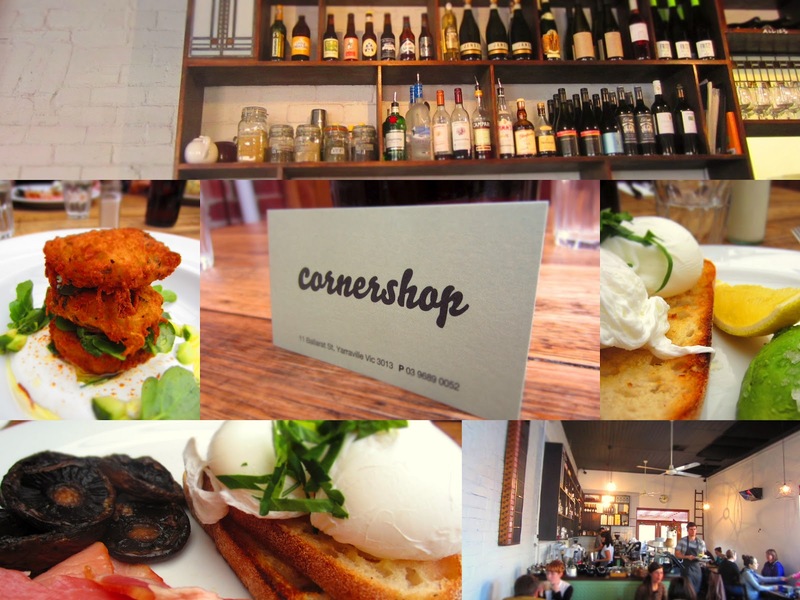 It was MK's turn to choose a place for our next BC meeting and having a friend who calls Yarraville home, The Cornershop was suggested. Being a bit of a noob when it comes to suburbs other than South Melbourne, North Carlton, North Melbourne and a select few others, I hadn't realised that such a quaint-sounding suburb even existed! Well, I should have known better. Yarraville is the epitome of trendy suburban Melbourne. Its main street is packed chock-a-block with all sorts of weird and wonderful-looking shops, the roadways lined with cars on either side, leaving just enough room for only 1 car to drive through at a time... (wait for it...) on a TWO-way street! And so fate would have it, that just as DS and I were trawling through this treacherous narrow twig of a road space thing, we came face-to-face (as close as road vehicles go) with a giant Land Rover! Seriously?! Yes, apparently so.. So after some nifty maneuvering by DS, we finally managed to get past and drove on to find a parking spot. BC newcomer AA was at hand to get us a table. What a chilly morning it was! AA, DS and me waiting at the corner of The Corner Shop, shivering in anticipation of our 3rd BC escapade (and also the cold). Oh what fun. There was however, a very cute beagle puppy that made waiting outside so much more bearable. It was absolutely adorable! But was unfortunately whisked away all too quickly by its owner who expertly packed it into the lower rung of his baby's pram! Yes, the little beagle puppy has its own little pram spot. I nearly exploded from the cuteness of what had just unfolded before me. We were soon joined by good 'ol BL, all smartly dressed, looking like a local who had just strolled down to the cafe for his regular cup of coffee. And then we were given a table! Yes, finally. Our table was around the back, in a very interesting enclosure that consisted of timber columns and beams supporting a frosted roof and transparent plastic walls. It felt like were outdoors, but not really. I thought it was pretty cool. The inside is quite different in that it has a bit more of an old school charm - perhaps it was the wooden shelf behind the counter, lined with bottles and jars that made it feel so (or the ladder leaning against the back wall, or the ceiling fans hanging from the dark timber ceiling, or a combination of all of the above..). Yes, I will stop my (somewhat poetic) rambling now. You must be waiting to hear about the food. I ordered myself the (erm...) potato cake thingy on some yoghurt other thing, and I think there were tiny bits of cucumber in there somewhere? Definitely drizzled with olive oil... Yes, I have left this post for too long, and alas have forgotten the name of the dish I had ordered! But all's good - a picture does paint a thousand words. So I shall say no more about this dish of mine, and let the pictures do the talking. Hah! BL's scrambled eggs looked gooood - nice and fluffy and soft and packed with eggy goodness. YUM. 'Twas a nice meal indeed - and good service too. I was happy. And relaxed. And full. And so were my fellow BCBs. And so, with our hearts warmed, and our bellies filled, we made our way out of this precious cafe, back to where it all started - the corner. And it was at precisely at this time that it occurred to me why the place was named so. And with that ended our 3rd BC meeting. More fun times ahead!! BC meetings have been put-off for a while due to my musical commitments, and the fact that everyone else seems to have something on on Saturday mornings. Those social butterflies. But they will be back soon :) Hopefully in 1 month or so. 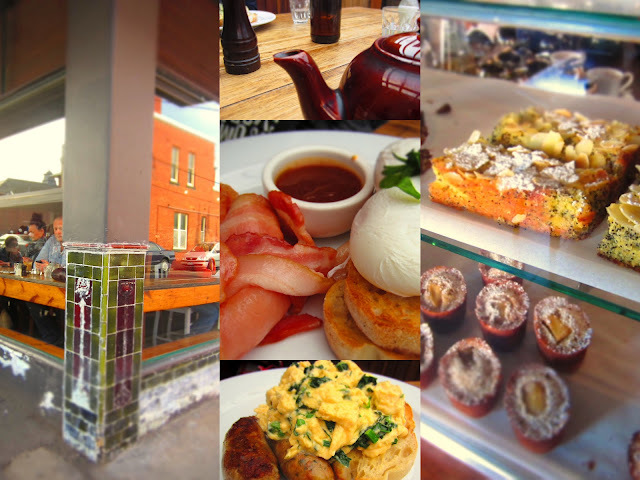 The 5/6/7 of us will be gathering to share our love of Melbournian breakfasts once more.